The 2017-2018 Aviva Rugby Union Premiership regular season concluded on Saturday with week 22 fixtures. Each season, I monitor performances against the previous season’s ranking (at the end of the regular season). In an act of spontaneous synchronicity, the 2017-2018 season ended with the 2016-2017 rankings in performance. Week 12 had the same synchronicity. The regular 2016 AFL season finished last weekend. Throughout the season, I followed each team’s performance against their ladder position at the end of the 2015 regular season. A good season would see a predominantly green and gold mix of colours (Geelong as an example this year). A poor season is dominated by blue and red (Essendon as an example). Coaches of blue and red teams come under significant pressure. Today, Brisbane announced that they had sacked their coach, Justin Leppitsch. Brisbane had two home wins this year. In Round 4 they defeated a higher ranked team (Gold Coast) by 13 points but did not win at home again until Round 21 (a four point victory over Carlton). The minor premiers in each AFL season do not have an opportunity for a gold win or a blue defeat. If they have a good season it will be predominantly green. Fremantle have had a predominantly red season. This has led to questions about Ross Lyon’s coaching style and ability. A green and gold season gives supporters hope. St Kilda’s final green win of the season at home was that kind of win. Up to and including 12 August, there have been 39 games at the 2015 Netball World Cup. On Thursday and Friday the Qualifying Group games will be concluded. All the teams at the World Cup were ranked in the most recent INF Ranking List (1 July 2015). There have been six games to date at this World Cup where a lower ranked team has defeated a higher ranked team. 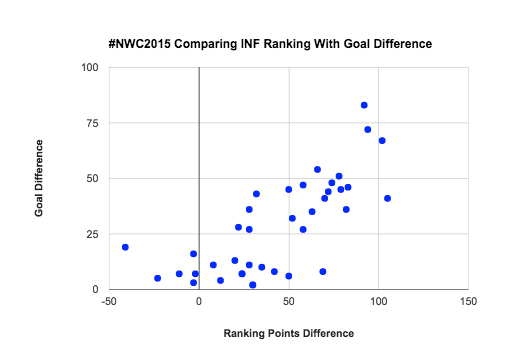 I have looked at the relationship between ranking difference and goal difference for 39 games played.